Being a relatively new maker of laptops, Huawei is trying to address high-end and niche markets to gain share, avoid direct competition with numerous rivals at the same time, and preserve its profit margins. 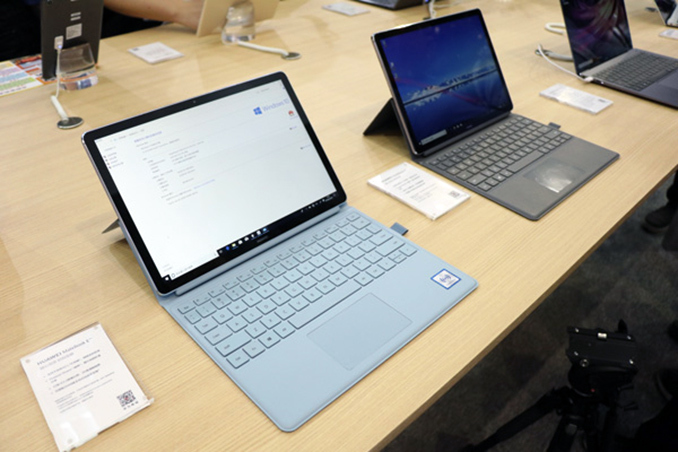 With numerous ultra-portable Intel Core-based notebooks in its arsenal, Huawei is working on a Windows 10 on Snapdragon 2-in-1 PC for those who want an always-connected machine. The Huawei Matebook E 2019 is actually even more portable than the company’s existing offerings. The convertible 2-in-1 notebook comes equipped with a 12-inch display featuring a 2160×1440 resolution, 400 nits brightness, and a 3:2 aspect ratio. 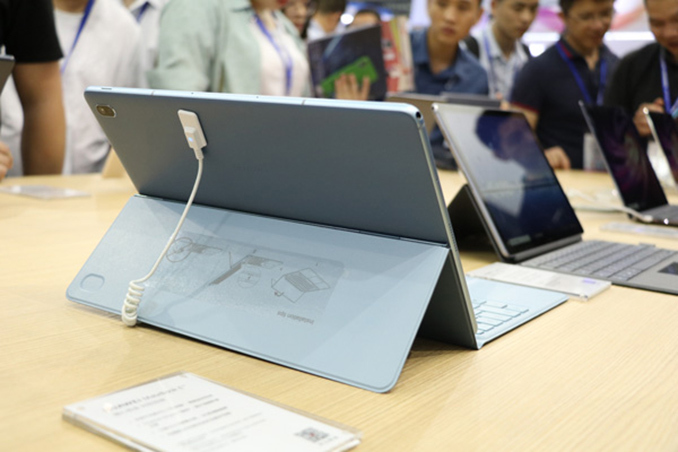 The chassis of the tablet (as well as its kickstand) is made of an unknown metal alloy and is 8.5 mm thick, which is a tad thicker when compared to other offerings in this segment. Meanwhile, the tablet itself weighs 690 grams without its keyboard cover and about a kilogram with it, bringing the weight of the whole system to the level comparable with ultra-light notebooks. Speaking of keyboard, it has a relatively large touchpad and an NFC chip to enable Huawei’s Share OneHop service, but no backlighting. Besides, it can hold Huawei’s M-Pen stylus. The Matebook E is based on the Qualcomm Snapdragon 850 SoC (four Kryo 385 cores at 2.96 GHz, four Kryo 385 cores at 1.7 GHz, Adreno 630 GPU) which is accompanied by 4 or 8 GB of LPDDR4X memory as well as 128 or 256 GB of USF NAND flash storage (it is unclear whether it is expandable using a microSD card). Since we are dealing with a machine powered by a platform originally designed with mobility and connectivity in mind, the Matebook E supports everything you come to expect from an Always Connected PC (ACPC), including the X20 LTE modem (Cat 18, 5CA, 4×4 MIMO, up to 1.2 Gbps DL, up to 150 Mbps U, 802.11ac Wi-Fi, and Bluetooth 4.1. Interestingly, the Matebook E is outfitted with an eSIM, but also has a slot for a regular nano SIM card. The tablet also has a USB Type-C connector, a fingerprint reader, two stereo speakers, and a 3.5-mm TRRS audio jack. Obviously for a 2-in-1 form-factor, the Matebook E feature the same set of sensors as regular tablets, including an accelerometer, a gyro, a light sensor, and so on. As for battery, it has a built-in 36.3 Wh battery that can last up to 20 hours. When it comes to imaging, the 2-in-1 notebook has a 20 MP main cam with autofocus and a LED flash, as well as a 5 MP camera for selfies. Huawei plans to launch its Matebook E 2-in-1 convertible in China already next month, but it is unclear when and if the company intends to release it on other markets as well. Other I/O Microphone, stereo speakers, audio jack, trackpad, etc. Why Snapdragon and not Kirin? Ian: When we were at Mobile World Congress, I put it to HiSilicon if they were planning to build a chip for Windows based notebooks with the name Kirin. They said that they were not, for the simple reason that the market is not yet mature. They are more than happy to let other chip manufacturers build a market first, before they insert their own hardware, and would potentially join a mature market, but not at this time. Despite this, this new product shows that Huawei is willing to at least dip its toe into the water with the already verified solutions on the market, even if it isn't Huawei's own chips just yet.